No one doubts that this month’s special session of the General Assembly to expand gaming wouldn’t have happened without the insistence and persistence of Senate President Mike Miller, who’s been pushing slots and gambling for a decade. A few loose ends from the session point out Miller’s command of the process and close attention to every stray vote. On Friday, Aug. 10, the Senate convened at 10:22 a.m., and debated the long and complicated gaming bill for nearly five hours, long enough that Miller took a break and let Senate President Pro-Tem Nathaniel McFadden preside for a while. When Miller returned to the rostrum – “five pounds lighter,” observed McFadden – he took up another of the two dozen amendments that were mostly rejected, then picked up the phone. Reporters and senators often wonder whom he is calling. In this case, at around 2:26 p.m., there was no doubt the nature of the call. Miller had inadvertently left his microphone on. “John, this is Mike,” says Miller in the archived recording. “I’m really disappointed that Simonaire voted with me and you didn’t on that f***ing amendment…” and then Miller goes silent. His chief of staff, Vicki Gruber, standing on the rostrum a few feet away, was gesturing to him as he talked on the phone, then went up and switched off his mic. 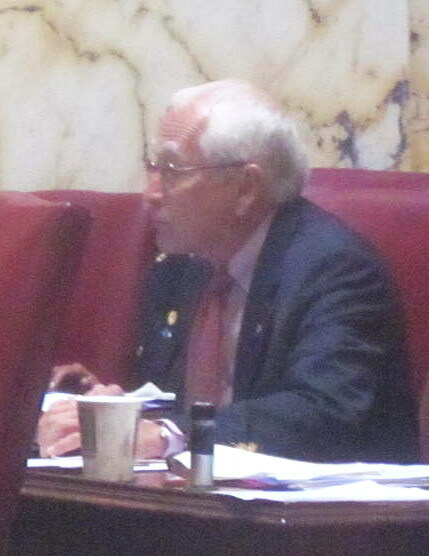 Only one senator is named John, John Astle of Annapolis, and Astle had just voted to approve an amendment by Baltimore County Democrat Jim Brochin that “scraps the entire sixth casino,” Brochin said. Brochin and a few other Democrats – Sens. Jim Mathias of Ocean City and Anthony Muse of Upper Marlboro – had voted for a bunch of the hostile amendments offered and supported mainly by Republicans, like Anne Arundel Sen. Bryan Simonaire. But on Brochin’s amendment, which failed 9 to 33, Astle — vice chair of the Finance Committee and a member of Senate leadership — voted against Miller, the only instance in recorded votes on 22 amendments that day that he opposed Miller. Brochin’s amendment would have left the bill intact – the addition of table games, 24-hour gaming, reduced casino taxes, restrictions on campaign contributions and so on – but stripped the one prize Miller clearly wanted, a large sixth casino in Prince George’s County, which is opposed by the owners of Maryland Live! at Arundel Mills in Astle’s home county. Brochin often votes with Republicans on fiscal issues, and is a constant aggravation to Miller, so much so that Miller had Brochin’s Towson Senate district redrawn to make it more Republican by taking it to the Pennsylvania line. Miller has been caught at least once in the past dropping the f-bomb from the rostrum, but that came at the end of a session, and it was edited out of the recording in barely an hour. The Aug. 10 recording of the phone call is preserved for posterity, at least for the moment. Late on Tuesday Aug. 14, as the gaming bill was nearing its final passage, Senate Republican Leader E.J. Pipkin, another thorn in Miller’s side, brought up the constitutional provision that prohibits one house of the legislature from leaving town for more than three days without the consent of the other chamber. The Senate adjourned Friday evening, Aug. 10, and didn’t come back into session until Tuesday night. Saturday, Sunday, Monday, Tuesday, said Pipkin – four days. “We haven’t been gone more than three days,” Miller responded. “The chair rules that it was three days,” Miller said with finality. “Three days, three days.”“It’s been four,” said Pipkin. Pipkin’s House colleague, Del. Michael Smigiel, had actually sued over the same issue after a special session in 2007, but the Court of Appeals had ruled against him. “We leave here on Friday at 6 and came back on Tuesday,” Pipkin insisted. Pipkin stopped arguing and sat down. Under Miller’s counting, when Jesus had died on a Friday and rose “on the third day,” as the scriptures say, Christians might well be observing Tuesday as the Lord’s Day. In its opinion (p. 26), the Court of Appeals gave little solace to Pipkin and Smigiel on the constitutional provision. In other words, it ain’t up to us, guys. It’s up to politicians like Mike Miller. Maryland’s high court doesn’t really want to be pointing fingers about timelines required in the state constitution. That document declares the opinions of the appeals court “shall be filed within three months of the argument,” but the court has ruled long ago that it need not follow that directive and seldom does. Case in point: The opinion in the 2007 Smigiel lawsuit was filed in August 2009 — more than 17 months after the case was heard.